How Do I Launch a Program from PowerPoint? If your PowerPoint presentation a requires software demonstration on screen, it would be very convenient to be able to launch the software directly from your slides. This tutorial will show you how. 1. Launch PowerPoint, and open the document that you want to edit from the Backstage view. 2. 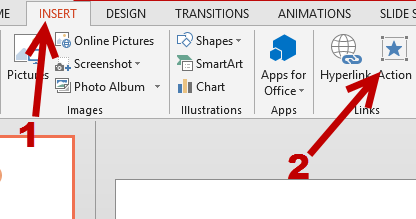 To be able to open a program from PowerPoint, you have to click on an object to trigger the launch. The object can be a text box, an image, smart art, or regular shape. First, select the object, navigate to the Insert tab on the ribbon, and choose Action. 3. Next, choose your desired mouse action tab. It is possible to launch a program when you click on the object or hover the mouse over it. 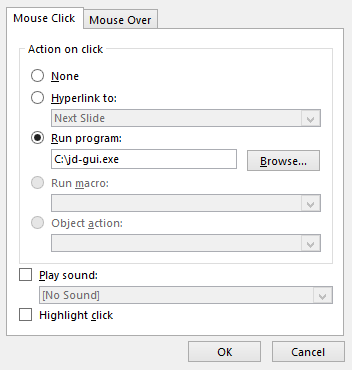 Choose the Run program option, click Browse, and point to the program’s executable file. If you have no idea where the file is located but you have a shortcut to it on the desktop, just select the shortcut, and PowerPoint will extract the file location for you. In addition to that, check the Play sound box if you want to play a sound effect on a mouse click. When you are done, click OK. Please note that the link to the program may be broken if you open the presentation on another computer. To fix this problem, the host computer must have the same program, and you may have to update the link to the file again. 4. Run the slides, and click on the object to test the changes. 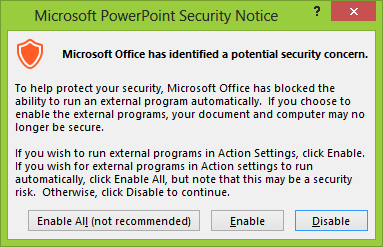 The first time you click on the object, PowerPoint will ask for your confirmation before launching an external program. This warning is required to ensure that no harmful program is launched. In our case, we already know that our program is safe to run, so we can just go ahead and click Enable or Enable All to launch it.